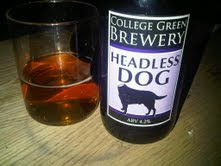 Headless Dog by The College Green Brewery, won the favourite beer at 'Deveney's of Dundrum, The Beer Festival'. This is a pretty amazing achievement. Not only was there 110 Bottled beers from all over the world to choose from, these guys are a relatively new Brewery and most importantly they're Irish!!!! We were very lucky to have Head brewer Owen Scullion present at the Beer Festival to promote The Headless Dog, Molly's Chocolate Stout and The Belfast Blond and this obviously paid dividends to the result!!! The Headless Dog is an amber ale brewed with North American Cascade and Munich Malt. The nose is both fruity and floral - loads of banana, fresh dough, violets and citrus fruit. The palate is violets, fresh strawberries with a biscuit finish. The quirky name relates to a mural on the brew house wall of a headless Labrador??? That, I can't answer but this is a really easy drinking beer. For those of you who have tried Tradewinds by Cairngorm Brewery and liked it, this is for you. Weeeell, it's not really a brewery at all: the beers are all made at Hilden, Ireland's oldest independent. Great night, by the way. This beer gave me a flash back to one night in Geraldton, Western Australia. I couldn't remember the name of the beer 'til later but it tastes like a better version of 4X Castlemaine. currently sampling a bottle purchased in devaneys this afternoon. lovely, lovely beer. light, tasty and i can now easily understand why it comes so highly rated. Glad we could sell you something really good!! 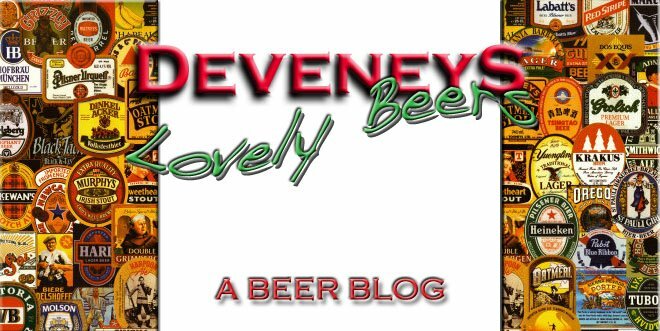 keep an eye on the blog and we'd be delightd to see you at our beer club... Thanks, R.